The format of Israel-Georgia Chamber of Business pays special attention to the support of diverse cultural events. 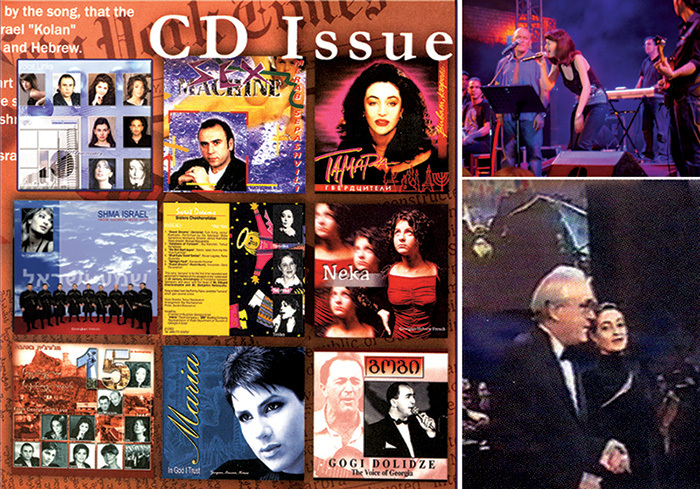 It shows best in show business projects: during the last decades COB sponsored production of many CDs with the recordings of the best Georgian and Israeli music and organized a lot of concerts of Georgian Israeli show-biz stars in the best concert halls over the world, such as Carnegie Hall, Olympia,etc. Our long-term collaboration with Tamar Gverdtsiteli, a Georgian singer with international status that resulted in her creative cooperation with Michelle Legrand and Jean Drejaque, should be specially noted. On the initiative of the Business Chamber, a new phase in the cultural relations of the two countries began, that included not only variety art, but other branches of art, such as classical music, sculpture, cinema, modelling, etc. At present Georgian artists are very popular in Israel, both among various strata of society and members of government. Obviously, one more phase is needed for the Georgian culture to achieve popularity in the whole society of Israel, as well as for Georgian theatre to become popular among Israel elite. The Business Chamber seeks to establish mutually advantageous cultural relations between Georgia and Israel. For this purpose, visits of Israeli groups, Israeli popular singers and dancers are frequently arranged in Georgia that promotes the Israeli culture in Georgia. On the occasion of 15th anniversary of the relations between Georgia and Israeli representative offices, the Business Chamber issued an anniversary compact disk "With Love From Georgia", with songs of well-known Georgian singers performed in the Jewish language. IGCOB does not limit itself with show business. Not long ago interesting ties have been established with the famous movie star Gerard Depardieu, as well as with French Haute Couture designers. The CD “With Love From Georgia” and the magazine ,were dedicated to the 15th anniversary of the relations between Georgia and Israeli representative offices. The CD and the journal “Successful Business Through The L ink Between Countries” were specially issued for the 10-year anniversary of Israel-Georgia Chamber of Business. At the COB, New Projects Department is particularly in charge of further promotion of the Georgia-Israel cultural relations. In 2009 and 2010 the department implemented number of successful projects, including participation of Georgian singers and artists in a famous international festival in Jerusalem “Hutsot Ayotser”, where Ia Chantladze has performed a famous Jewish hit “Lekol Ehad” with a Jewish star Shlomi Shabat. A Georgian singer who presented the country at Eurovision song contest – Sofia Nizharadze participated in the same festival in 2010 performing her hit “Shine” in Hebrew. In 2012 Hutsot Ayotser has once again become a stage of important promotion of Georgian culture in Israel: Ia Chantladze dressed in Georgian national costume opened the festival with the composition “Georgian Dance”. We strongly feel the need of a new wave of cultural events both in Georgia and in Israel to promote Georgian culture even more within the Israeli society. As a starting point of the new phase of activities, we see a cooperation of Israel show-business celebrities Yoav Ginai and Tomer Adadi with Georgian show-business that will be supported by Israel-Georgia Chamber of Business.